With the presence of a large pool of participants, the global blood glucose test strips market is displaying a highly competitive business landscape, finds a new research report by Zion Market Research (ZMR). Abbott Laboratories, B.Braun Melsungen Ag, i-SENS. Inc., AgaMatrix, Bayer Healthcare AG, TaiDoc Technology Corporation, BioSensors, Inc., Universal Biosensors, Beijing Yicheng Electronic Co., Ltd., HMD Biomedical, LifeScan, Inc., and F. Hoffmann-La Roche Ltd. are some of the key vendors of blood glucose test strips across the world. These players are focusing aggressively on innovation, as well as on including advanced technologies in their existing products. Over the coming years, they are also expected to take up partnerships and mergers and acquisitions as their key strategy for business development, states the blood glucose test strips market study. Citing an instance, in October 2018, Johnson& Johnson Unit won a legal suit over infringement rights pertaining to blood-glucose test strips patents against a medical device maker in Nevada, United States of America. In a major boost for blood glucose test strips market, in October 2018, Innovus Pharma – a U.S. headquartered pharmaceutical company offering safe, new, and efficient over-the-counter medicine & consumer care products –declared that it received a green signal for its two products, namely, GlucoGorx™ Blood Glucose Monitoring System and GlucoGorx™ Blood Glucose Test Strip for Medicare compensation. As estimated in this report, the global blood glucose test strips market stood at US$11.04 billion in 2017. 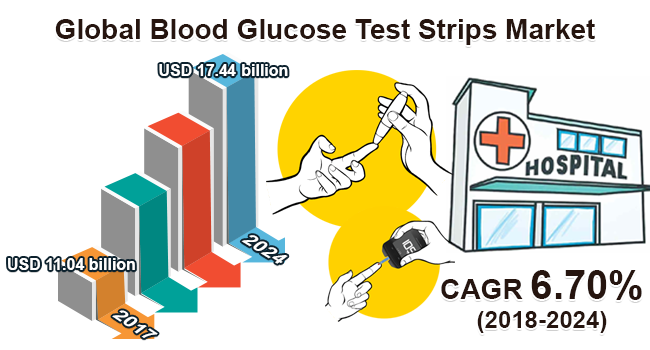 Witnessing a tremendous rise during the period from 2018 to 2024, the revenue in this blood glucose test strips market is expected to reach US$17.44 billion by the end of the forecast period. “Growing incidences of diabetes mellitus resulting in massive demand for screening and monitoring technologies will drive blood glucose test strips market trends,” says the author of this blood glucose test strips market study. Apart from this, rising elderly population and an alarming rate of increasing number of type-2 diabetes mellitus are anticipated to drive blood glucose test strips market growth in the years ahead. In addition, the concentrated efforts by pharmaceutical companies, skilled healthcare professionals, and government officials to instruct people about the significance of diabetes test strips are also anticipated to have a positive impact on the growth of the blood glucose test strips market during the forecast period. Regionally, North America has been leading the worldwide blood glucose test strips market and is anticipated to continue on the dominant position in the years to come, states the blood glucose test strips market study. Rising healthcare understanding and awareness about the screening and monitoring technology for diabetes is the main factor behind the dominance of the North America blood glucose test strips market. The high number of market players being headquartered in North America is another significant factor that is supporting the growth of this regional blood glucose test strips market.